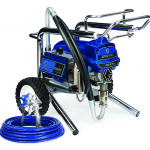 The Husky 3300, 3 inch (76.2 mm), pneumatic double diaphragm pumps feature a four bolt joint design, which provides even sealing pressure for leak-free operation and a three-piece manifold for increased installation flexibility. Available in aluminum, polypropylene and stainless steel. ** Startup pressures and displacement per cycle may vary based on suction condition, discharge head, air pressure, and fluid type. *** Sound power measured per ISO-9614-2. Sound pressure was tested 3.28 ft (1 m) from equipment. Santoprene® is a registered trademark of the Monsanto Co.
Our new Husky 15120 pneumatic double diaphragm pumps have a single piece polypropylene center section for increased reliability and chemical compatibility, plus a patented, high-reliability modular air valve that is online serviceable. Design improvements include the overmolded frame which provides improved reliability and helps to eliminate fluid leakage and an updated diaphragm design that increases flow with flow rates up to 120 gpm (454 lpm) – making it one of the most efficient pumps on the market. Minimum ambient air temperature for operation and storage. NOTE: Exposure to extreme low temperatures may result in damage to plastic parts. Noise (dBa): Sound power measured per ISO-9614–2. Sound pressure was tested 3.28 ft (1 m) from equipment.